The standout track on Porter's 2010 LP "Water", "1960 What?" was soon picked up by Expansion, introducing the wilder world to the expressive vocals and jazz-flecked style of the now universally acclaimed soulman. Taking a civil rights flashpoint as his inspiration, Porter offers a lyrical narrative of injustice, police brutality and rioting, his rich voice expressing emotional complexity and moral maturity as he goes. When taken with the propulsive double bass line, crashing jazz percussion and thunderous brass, the message takes on a revelatory weight, especially considering the contemporary issues of racial discrimation and police brutality overshadowing the USA. Alongside the deep and political soul jazz of the A-side, the Expansion release offered a STELLAR remix from boogie revivalist Opolopo, who quantised the track for easy mixing and dance floor consistency before adding a weighty club kick and thick synth bassline, resulting in a fresh version which filled dancefloors for the house, soul, jazz funk and disco scenes. Killer stuff. 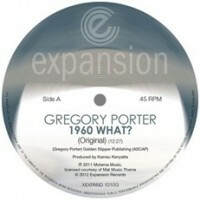 Patrick says: Expansion give a fresh press to one of their finest contemporary releases (It's 7 years old, but Dave swears it was yesterday), Gregory Porter's protest soul smasher "1960 What? ", with that killer Opopolo house remix taking the lead. Essential stuff.